The jumping spider at left is from the genus Habronattus, and was spotted on a twig of a Mexican Blood Flower. Measuring about 1/3 of an inch, it is tiny and inconspicuous, but don't let that fool you. 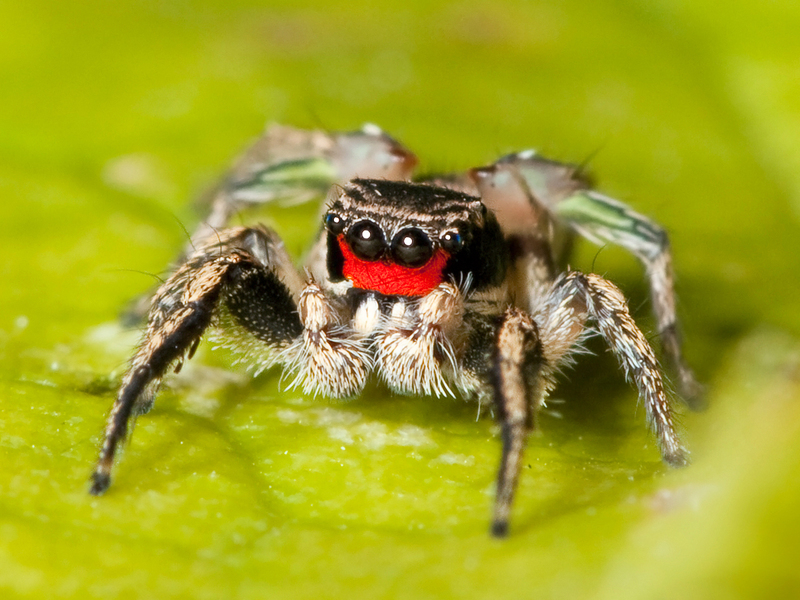 All jumping spiders have excellent eyesight to aid them in hunting. And as their name suggests, they have great jumping abilities, allowing them to leap many times their body length. However, their most interesting behavior may be how they react to humans. 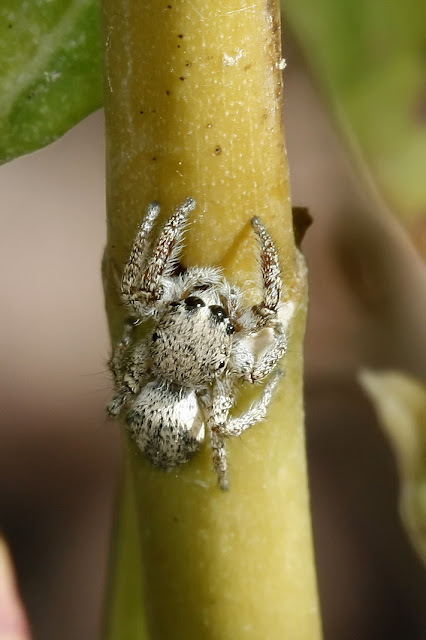 Jumping spiders, when approached by a human, tend to stay put and observe. They can often be handled, and make excellent macro photography subjects if you find an especially tame one. This "tameness" is unique among spiders and most insects. And the image of being tame and inquisitive is further enhanced by their 'facial features', which appear to impart expressions (see photo below for an example). Spiders, like many "bugs", consist of thousands of species worldwide. In fact, jumping spiders (family Salticidae) alone contain over 5000 species. When you factor in regional and seasonal variances, it becomes quite a challenge to identify species. Jumping spiders in general can be loosely identified by the arrangement of their eyes - all in a row, with their middle eyes substantially larger. Behaviorally, they are hunters, so you will not see them with or in a web. They do spin silk to "tether" themselves when jumping. And be sure to check out my other Macro photos. Great macro shots!! The detail on that tiny spider is amazing. You have captured some amazing detail. Great shots. Gorgeous little creatures - one subject that I really want to find to take some photos of. Wow...what detail and clarity! Great shots! I'm always surprised to see them in my Macro Flower Shots....don't usually see them until I get them on the computer. I can tell you have a powerful zoom to be able to capture them with such detail. Awesome macro shot! He is so ugly he is cute! Those shots are stunning! I looove the second one - what a colourful little chap he is! We have tiny little jumping spiders here (we call them 'wolf spiders' because of their method of hunting) but nothing like this one! Our 'harvestmen' (opiliones) have a similarly interesting habit, in that if you catch them in the light they will freeze. I have some nice macro shots of those, somewere (on film).